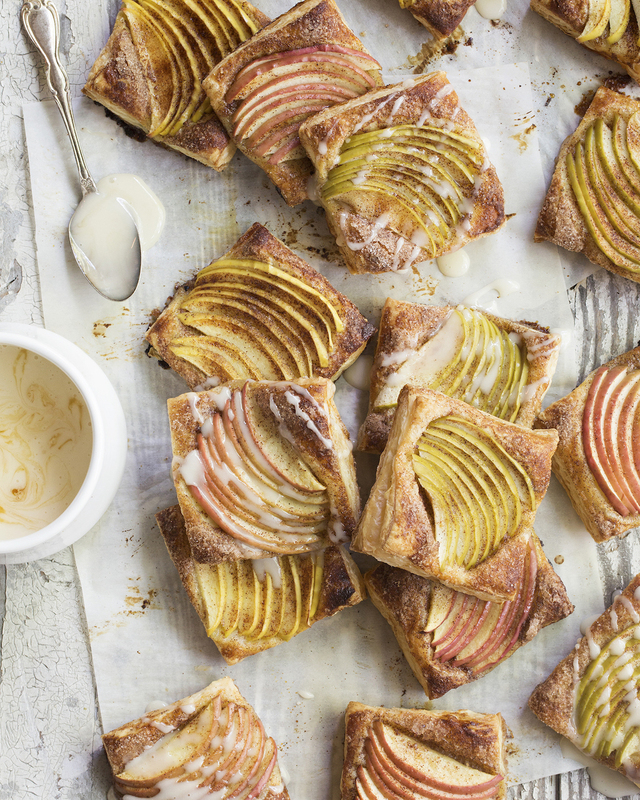 Today I am sharing my recipe for these delicious Apple Tart Squares with Honey Glaze that really highlights the beauty of this season’s bounty of apples with the signature crunch from puff pastry dough. What isn’t there to love about puff pastry dough?! First off, the crunch of perfectly baked puff pastry dough makes for a uniquely scrumptious bite and the fact that it can always be stored in your freezer means you are always ready to whip up a dessert for any occasion. Once defrosted, there are endless possibilities for what you can make with a sheet of puff pastry dough, so I encourage you to play around with puff pastry dough and come up with your own creations because almost anything you do with puff pastry dough will be a hit! Preheat the oven to 400 degrees Fahrenheit. Place the puff pastry dough on a large cutting board and cut into 9 3x3 inch squares. In a small bowl combine the cinnamon and sugar. Brush the top of the dough squares with the egg wash then sprinkle lightly with cinnamon sugar. Place eight apple slices, fanned out, on each of the squares. Spoon about a teaspoon of melted butter on top of the apples then sprinkle generously with more cinnamon sugar. Bake for about 20 minutes until golden brown. In a small bowl combine the powdered sugar, honey, and milk to make the honey glaze. Serve the Apple Tart Squares warm or at room temperature with the honey glaze. These were lovely! I wouldn’t change a thing! What’s the best way to store these and how long do they keep? The best way to store them would be in an airtight container. They will last about a week. But in my house, we usually eat them before then!